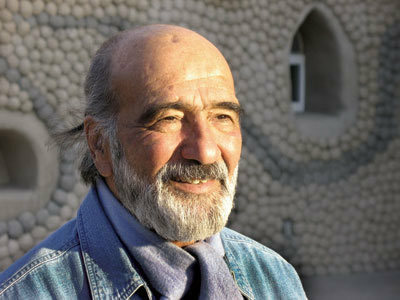 The Father of Earthbag Building, Nader Khalili, died peacefully, surrounded by his family, a couple of days ago. He was 71 years old. “The flames that ignited him in life and the quest that brought each of you to Cal-Earth to learn from him have touched all of us and led us on this path….the right path……. for arts, humanity and the environment. His work and words have inspired us and his spirit is powerfully alive in every work and word, building and echo that your enthusiastic and loving hands have helped to create for this world. Born as an Iranian, Nader lived most of his life in the United States, gaining an architectural degree. He worked on the design of high-rise buildings and taught architecture in Southern California. In 1991 he founded Cal-Earth (the California Institute of Earth Art and Architecture) based in the desert region of Hesperia , California. From this center, he taught classes and workshops on the use of both bricks and bags to fashion domes, arches, vaults, and irregular shapes. These forms sprang from his early exposure to Middle Eastern architecture. The earthbag concept evolved from attending a 1984 NASA symposium for brainstorming ways to build shelters on the moon. He realized that bags filled with lunar “dirt” could be stacked into domes or vaults to provide shelter. This concept was later refined to include stretching barbed wire between the courses of bags to help stabilize the structure. Nader never referred to this building technique as earthbag building; he preferred to call it “Super Adobe,” referring to the fact that he generally filled the bags (or long tubes) with an adobe soil mix. In 1999 Nader was issued a U.S. Patent for his Super Adobe technique and he subsequently tried to require contractual arrangements for its use. At this point, however, he had been publicizing the idea for so long it was not an enforcable patent, and few would comply with his request. This fact points to the complex nature of Nader’s personality. He truly loved humanity and the arts, and was an eloquent and passionate speaker. He often said that his ideas were a gift to humanity and he hoped they would provide shelter for the poor and disadvantaged. At the same time, he wanted to control the economic potential of his invention, and he pursued this vigorously. Nader was the author of several books, including Ceramic Houses and Earth Architecture: How to Build Your Own, about literally making ceramic houses, and Sidewalks on the Moon, an autobiography. He also wrote several books about the the mystic poetry of Rumi. Interestingly, he never really wrote a book about his Super Adobe invention, allowing others to take the lead in doing this. With the passing of Nader Khalili we have come to a point where his ideas and work can truly become universal. All of us who explore the potential of the earthbag concept and expand on its possibilities can help further his vision for bettering the world. We owe a great debt to this truly inspired individual. May he rest in peace! you were a great man in this life and we miss you already.. i'm sad i didn't get to say goodbye nader. see you on the other side... c.m. A truly amazing Human, way before his time for in his time there is no polution or wars or hatred. Only beautiful and harmonious relationships between humankind and nature around. His is a gift I will fight to keep alive for the rest of my life as well as pass on to others, someday we may see his visions realized and he will be known for his sensetive creativity!